Behind the images and narratives of progress, effectiveness and innovation of electronics that make us believe in dematerialized technology without consequences (Gabrys, 2011:57), there is something dirty and ‘forgettable’ (Hird, forthcoming). That is electronic waste (e-waste). Over the past November and December, I followed a group of informal waste pickers in Barcelona to study how they re-materialize and re-purpose discarded computers. What I found is that e-waste is not merely about dirtiness and forgettable materials. It is also about innovative everyday practices that compete to establish and negotiate different ontologies of value and functionality as waste moves across different legal regimes. A common European Directive, the Waste Electrical and Electronic Equipment Directive (WEEE), currently regulates the Spanish system of e-waste management. As a legal tool, the WEEE defines a new scenario where agents are more interconnected with their (contaminating) activities and responsibilities. Institutionally, the circuit of e-waste management lies on the so-called Extended Producer Responsibility (EPR). This means that, at least theoretically, producers are responsible for the collection, treatment, evaluation, and, if applicable, elimination of waste related to their products. However, as Queiruga et al. (2012) argue, this is not what actually happens. In practice, fines and responsibilities are divorced, and the ‘polluter pays’ principle’s core is corrupted. Although citizens pay (through an invisible tax that doesn’t appear on bills) for sustaining the treatment of the WEEE, only producers (through the EPR) and recycling companies have the right to deal with waste and to make a profit from it. Producers pay municipalities for the collection and temporal storage of waste and then companies make a profit through the dismantling and recycling of waste, which is sold and returned to the production industry. This European-wide legal framework is supplemented by different municipal laws. In Barcelona, where I conducted my ethnography, the Municipal Ordinance regulates the use of urban public spaces establishing that “the selection and extraction of waste placed in the public thoroughfare” is a minor infraction that is fined with up to 450,76€. This means that recovering things from the street in order to reuse them is penalized. 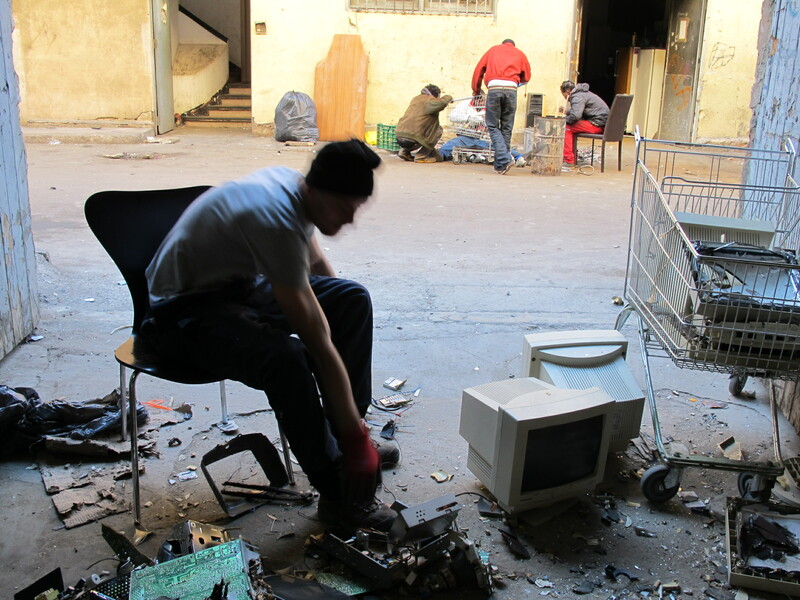 Different agents defy these legal dispositions, like the illegal migrants, most of them sub-Saharian, who have been living off waste collecting for almost one year in a squatted industrial complex of warehouses. Most of them get up early in the morning and scour the city with a ‘shopping’ trolley looking for scrap and all kind of materials and objects, which then they bring to the warehouse, where everything is separated and classified. Dealers buy scrapped computers and electric and electronic components from these waste-pickers and check if they work. If they don’t, they are dismantled into different pieces, such as metal cages, motherboards, or materials, like copper from wires, and are then sold by weight to scrap-yards; functional pieces, such as hard-disks or memory RAMs, are recovered and sold to companies or personal contacts which use them for assembling “new” old computers. Other computers just need to be repaired and have their OS reinstalled. Working electric and electronic appliances are sent by trucks and vans to Africa. Both content and container, appliances and trucks, are then sold in African second-hand markets. Tilan lives in a nearby squatted warehouse and he is the guy who repairs some of these computers. He tests them, tries to repair them, or dismantles and reuses the functional components in order to assemble new computers. Then he installs pirated OSs such as Windows 7 or XP. He has learned how to do it thanks to ‘the Czechs’. “They know a lot about it”, he says. The Czechs were his housemates and he has learned by quietly observing how they repaired. He blames some of the waste-pickers, most of them from Romania, who treat computers as if they are just a piece of metal, handling them like scrap. In Tilan’s view they aren’t scrap: dumped computers are valuable and need to be carefully treated in order to reuse some of their components. If they are dropped, the components may be ruined. The growing number of people scavenging bins and pushing their supermarket trolleys full of scrap, attests to the unsustainable patterns of technology’s consumption cycle and problematises utopian narratives of innovation. Importantly, they also hint at the re-materializion of electronics that takes place through their collecting, dismantling, repairing and re-assembling, which keeps these computers in operation and in circulation. By constantly re-imagining e-waste, these waste-pickers and menders create new forms of value and informal innovation. The innovative character of these practices lies in the fact that they defy e-waste destiny and its ontology: in their hands, a waste-computer is not a singular object defined by its disposal and treatment after manufacture and consumption, instead it is a precarious and temporal knot of heterogeneous assemblages in transition. The key point here is the (possibility of) transition. A computer in the bin, like the boats Gregson et al. (2010) describe, is not valued “for what it is, but for what it ‘might become’” (Ib. 2010:853). Informal waste pickers do not work with certainty and ‘actuality’, but with pure ‘virtuality’ and possibilities of ‘becoming’ which transform brokenness, failures or legal restrictions into productive occasions. When an old computer is considered waste and then dismantled and reassembled, it is being transformed from a static metal ‘black box’ into an open modular object. In this sense, waste-pickers can be easily compared with the Parisian maintenance workers of the transport system followed by Denis and Pontille (2011): both “go through what one would see as the ʻnaturalʼ boundaries of things, and explore and test the relations of components” (Ib., 2011:7). 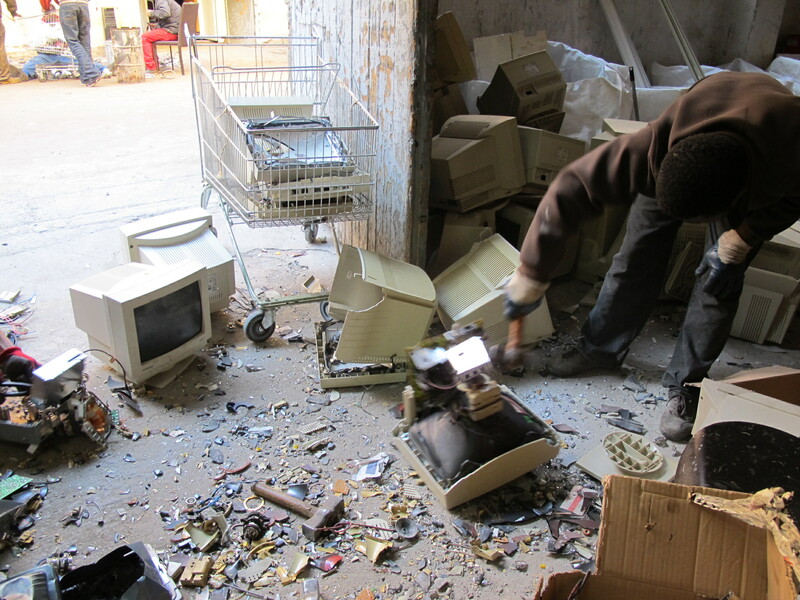 These waste-pickers operate in a register in which success, functionality and value are not defined by the closure and stability of computers as ‘black boxes’ through manufacturing (Lepawsky and Billah, 2011:135), but by their ability to move across different ontology registers after they have become waste. This movement, however, is not easy. It depends on different technical knowledges, personal networks, and savings, and implies several risks, like defying European and municipal laws or crossing a desert to deliver them in Africa. Success and failure, it follows, cannot be mapped onto different kinds of objects (e.g. functioning vs non-functioning objects). As a matter of fact, the same object, a computer, can be inscribed in (and by) different logics: the logic of the material and the logic of function, which imply two different value systems defined, alternatively, by weight or bytes. This ontological and temporal issue is the reason for Tilan’s complaints about Romanian pickers and also reflects a current tension. The urgency of earning one’s living means that success doesn’t always mean to repair and re-assemble a computer, but can also mean to destroy and take it apart in components and metals that can be quickly turned into ‘fresh’ money. A first inspection of the outward aspect of the object and a quick test to check whether it starts up are ways to calculate the potential profitability of the object. Depending on the result, the waste-pickers will decide whether to take it apart or to sell it as an entire object for being re-assembled and repaired. The story about Tilan and the others talks about ‘outsiders’ and illegality, and how they intersect, at different points, with the formal circuit: challenging it, when they collect stuff from the bins; dealing with it by symbiotic complicity when they sell the remains after dismantling to recycling and scrap traders; or complementing and polishing it, when they selectively collect stuff from streets and dismantle, classify and sell components and pieces to be later recycled, while earning money throughout the process. Legal and illegal, formal and informal cross over and leak into each other. In this sense, this story shows how we cannot rely on linear and formal accounts to understand the regime of e-waste. This waste regime (Gille, 2010) requires a combination of different scales, circulations and exchanges of boundaries and edges, and a complex meshwork of overlaps, intersections, leaks and detours. It follows that, if we are to understand a particular waste regime it is not enough to pay attention to institutional and formal practices, we also need to pay close attention to those informal, unknown, intentionally hidden or ‘forgotten’ agents and practices that discretely traverse the streets.